People have been saying ever since the new F01/02 7-Series debut back on July 3rd, that it is either identical or very similar to that of the Lexus LS 460. Is this true? I don’t really think that it’s a point of the new 7 looking like the new LS. We know they look alike, because Lexus copied enough off of the old 7 to always bear a BMW theme. It even has its own version of the Hofmeister Kink. Let us take a close look at the design comparisons between the two cars. The more you look at the new 7, the more you realize that the BMW is way above the Lexus in so many ways, but styling especially. The F01/02 7 has been a big hit in its true design theme. It has taken BMW to a whole new era of principle. The CS Concept design has been lent to the new 7. Which is something we all wanted. But, some say the new 7-Series is ugly, and that it copies too much of the Lexus LS. The new, 4th Generation, Lexus LS came onto the scene in 2007. People loved it. But many critics said, “Why does it look a lot like the 7-Series?” And you could hear a low sigh by many automotive journalists around the world who realized that Chris Bangle was right, and that his designs were now taking shape in more cars. Even from Toyota! With the new generation you are able to get either an LS 460 or a long wheelbase version dubbed the LS 460L. You could also get a new LS 600H, or the LS 600H L. The H standing for Hybrid, of course. What would Toyota be without a Hybrid version of every car they make? I actually saw an LS 600H L last night while driving around the downtown area… The front LED style lights look very upscale and nice, at night. And then you see the rest of the car and you aren’t really impressed. At least I’m not when I see one. Now, let’s show you the true similarities and differences. 1) Notice the tailpipes of the new 7. They look nothing like the Lexus. Sure, they are in the same style of rectangular tips. The BMW’s, however, make for a more elegant and classy look. Whereas the LS’s pipes try too hard to show off and be flashy. 2) Take a good look at the rear bumpers of all 3 cars. The BMW 7 shows a much more flatly rounded surface, where the LS is more flared and rounded off. No real similarity there. 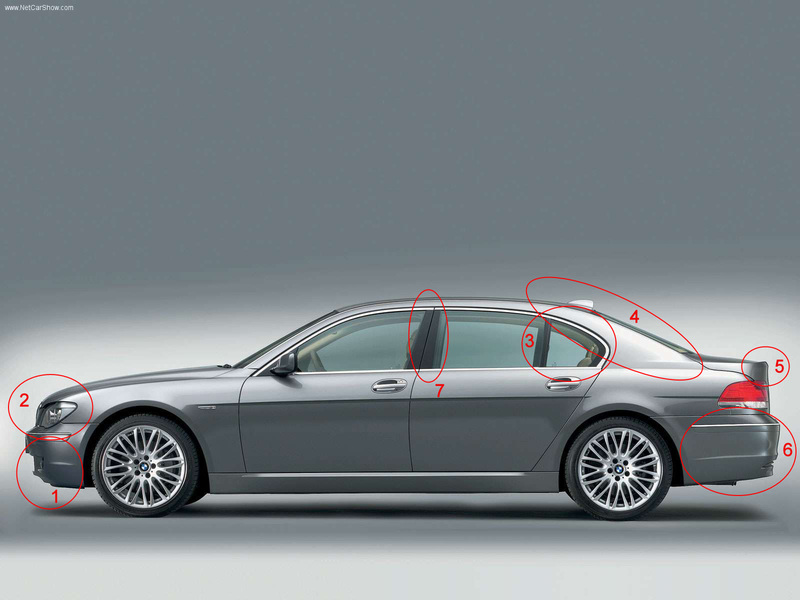 3) The rear decklid is a very similar shape and height from the E66 750Li to the Lexus LS 460L. The new F02 750Li only shows a more unique view and design essence of the old 7. 4) Look at the shape of the windows on the BMW’s and the Lexus. Notice anything different? Yeah, neither did I. 5) See how the new 7 builds on its lights? You can see a 7 theme within the taillights, which I thought was very unique and interesting. The real lights actually try to look similar to that of the front headlights. What have we learned here? We have, hopefully, learned that the new 7 copies nothing from the Lexus LS. It actually takes the simple and bold design theme of the old 7 and builds on a bold theme, but with more emphasis placed on beauty, smoother lines, and much more attention to detail. 1) Notice the front lower lip/grill of the E66 7. The LS 460L is nearly identical in style and amount of lip presence. 2) Notice the lights of the LS speak to nearly identical units of the 7. Granted, there are some minor curves to make them look different. But, the more you look, and the closer, for that matter, you see identical units. 3) Notice the rear Hofmeister Kink. Lexus has hidden their exact version of the Kink with a sharp line and point to try and shy away from the exact same design. Notice the lines I have had drawn in to show how it is actually sculpted, but with the chrome piece to hide it. 5) Lip spoiler on the Lexus LS shows its glaring approval of Chris Bangle’s design genius. Thank you Lexus for just reassuring that Bangle’s designs are widely criticized, but almost always used. Take notice that there is no design direction that the F01/02 7-Series take from the Lexus LS. If you take a closer look, you will see that Lexus copied so much of the design of the old 7, that it would have been impossible for them to not look similar to a new 7. If you don’t look more closely, just like most Lexus fans, you won’t see it. This is a position held by Lexus fanatics, because they can’t argue that BMW has taken anything from them. They do, however, try to hide the fact that Lexus has copied, and copied, a lot of things that BMW or Merceds-Benz have done since their inception.